Hi Piso Fare friends! The new Cebu Pacific promo fare is in! Sale seats are available for booking from today until October 6, 2016. The promo fares of Cebu Pacific are good for travel for November, December 2016, January and February 2017. So, if you have not secured your trips on the incoming holidays, check the availability of promo flights on your proposed travel date. Cebu Pacific sale tickets are LIMITED, that is why it is best to book right away as soon as a promo deal is available. Affordable domestic travel for Bacolod, Kalibo, Cebu, Iloilo, Naga and other local destinations can be obtained via this seat sale. Included in this promo are flights to Hongkong, Singapore, Macau, Taipei and other Asian destinations. Cheap tickets to Japan (Fukuoka, Nagoya, Osaka and Tokyo), Middle East routes and Sydney are also on sale. Manila to Bacolod, Cauayan (Isabela), Cebu, Iloilo, Kalibo, Laoag, Legazpi, Naga, Roxas, San Jose (Mindoro), Tacloban or Tuguegarao. Quoted Cebu Pacific low fares are good for one-way trip inclusive of base fare, taxes and fees, Web Admin Fee and free 7 kilos hand carry bag. The domestic terminal fee is included in the promo flights from Manila, Cebu and Caticlan, while terminal fee for the other stations will be paid at the airport during departure. International terminal from Manila is covered in the ticket. The international travel tax of P1,620 is to be paid in the airport upon departure. You may also buy the Cebu Pacific promo seats at ticket outlets or booking offices. 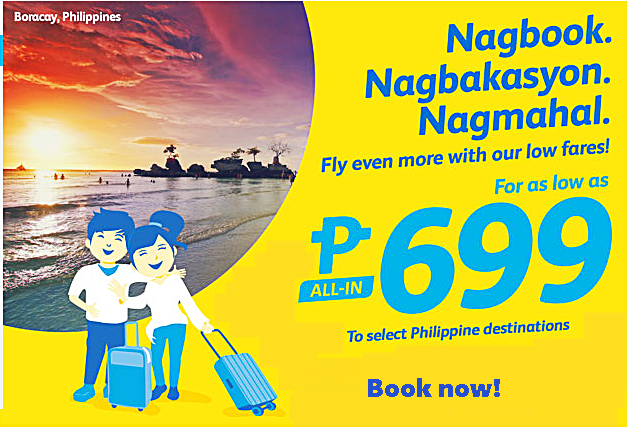 Call the Cebu Pacific hotline at: (02) 7020 888 (Manila) or (032) 230 888 (Cebu) and book your promo flights with their CSR. Do you want to save more on your trip? Get Prepaid Baggage Allowance if you will be bringing sizable amount of luggage. You may choose from the following Prepaid Baggage Options: a) Small or up to 15 kgs, b) Standard or up to 20kgs, c) Large or up to 30 kgs, and d) Extra-large or up to 40 kgs baggage. Check the comparison on prepaid baggage rate to airport baggage rate HERE. Cebu Pacific promo seats are LIMITED! Book fast and enjoy your affordable flights to your desired destination! LIKE and FOLLOW us in our Facebook fan page: PISO FARE Tickets for more promo fare and travel updates!! !